My earliest memory of this sweet smelling fragnance goes way back to when we were little, mom or dad used to powder our faces every morning with Yardley's English Lavender. I can still close my eyes and clearly recollect its distinct soothing and calming fragnance. Fast forward to the present, and every June, Britian is filled with bunches of this sweet smelling, tiny purple beauties. An absolute visual and sensual treat. Popular in the skin care, beauty and relaxing therapies industry, I was on a mission to find a use for it in my kitchen. 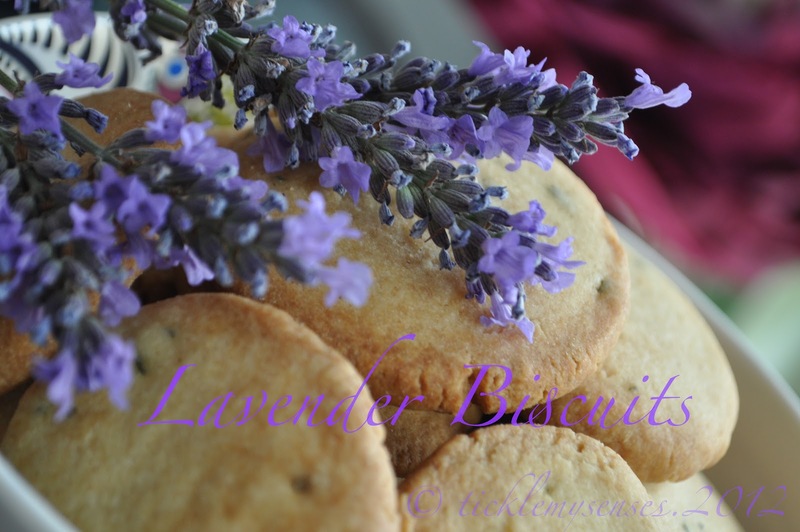 After hunting high and low for an edible treat with lavender, found a recipe for "Lavender Biscuits" by the well known Chef Gordon Ramsay. Without a second thought these biscuits were made, couple were eaten minutes after they left the oven, remainder put into packets and shared with friends. These biscuits are very easy to make, mildly sweet, extremely short, buttery and melt in the mouth, truly irrestible. 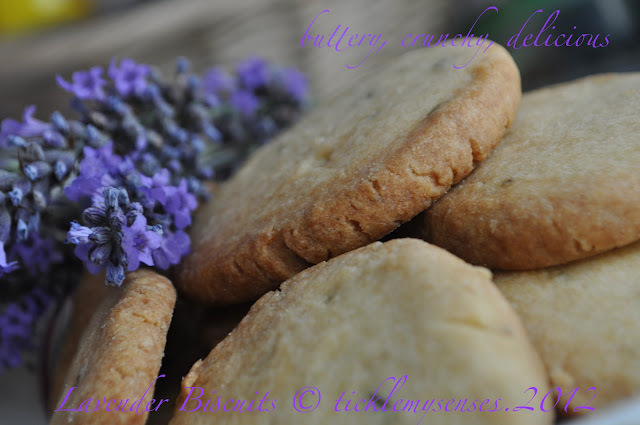 The freshly chopped lavender leaves and flowers added to the biscuit dough give these biscuits a subtle aromatic and magical touch. Would make a very good gift to cheer a friend up, or an excellent tea time treat when you have family/ friends over. 1. Cream the sugar and butter together until light and fluffy. Add the flour and lavender leaves and beat with a wooden spoon until the mixture starts to come together. Turn out on to a lightly floured work surface and knead briefly to form a dough. Flatten to a disc, then wrap and chill for 20 mins. 2. Preheat the oven to 180C/Gas 4. Roll out the biscuit dough on a lightly floured work surface to a thickness of half a centimetre. Sprinkle over the flowers and gently press them into the dough with a rolling pin or your fingertips. Using an 8cm pastry cutter, stamp out rounds then transfer to a greased baking sheet.Bake for 7-8 mins until lightly golden. 3. Remove from the oven and leave on the baking tray for 2 mins before releasing with a palette knife. Slide on to a wire rack to cool. 1. To harvest the flowers for drying, cut them just before all the buds fully open. Hang in small bunches upside down in a warm, dark spot with good air circulation. Make a sachet of dried leaves and flowers and place between your pillow and pillow case to enhance a good night’s sleep. 2. 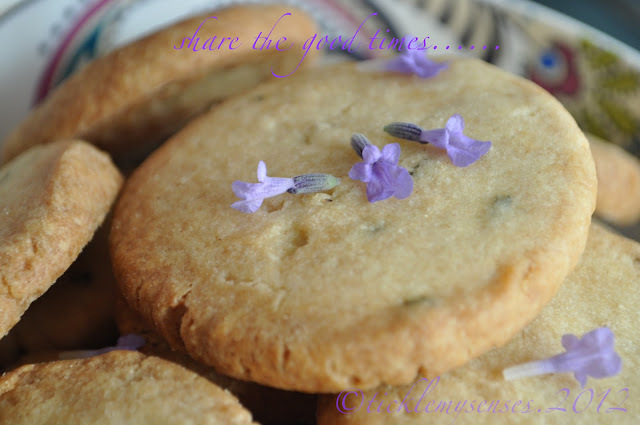 Dried and fresh Lavender flowers are edible. When cooking with lavender, use 1/3 the quantity of dried flowers to fresh. Use the flowers in salads, added to soups and stews, used as a seasoning, baked into cookies and brewed into teas. 3. Lavender is a member of the mint family and is close to rosemary, sage, and thyme. It is best used with fennel, oregano, rosemary, thyme and sage. Oven baked tomato chicken- for little tots.